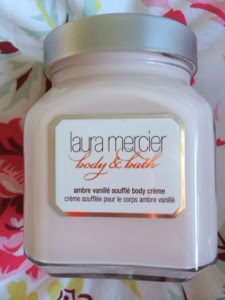 I'm not even sure where to begin with this, but I recently bought the Laura Mercier Ambre Vanille Souffle Body Creme, it was a bit of a risk because I hadn't smelt it before and I'm quite particular with the kinds of scents I like, also I have quite sensitive skin and sometimes, highly fragranced products can cause irritation, but I wanted it so I decided to go with it, I also had some Birchbox points saved up so it meant that I got it for the quite amazing price of £6 with free delivery. Anyway, I digress, this smells so flipping amazing that I don't want to use perfume or anything else after putting this on, plus the smell lingers, I even got a faint smell of it after showering the next day, it's like a woody, deep, caramel-ly vanilla scent if that makes sense! It's very strongly scented so if you're the kind of person who doesn't like a strong scent, this may not be for you, I normally don't but I'm ok with this one. The texture is lovely, it's a body cream but a thick cream, not far off of a butter, and a little really does go a long way and leaves skin feeling super smooth, I tend to put this on in the evening after I've had a shower and like I said in my last post, I'm not in the mood for hanging around waiting for my moisturiser to dry when it's cold but this actually sinks in very quickly and doesn't leave that sticky, tacky feeling that some moisturisers do when they haven't quite sunk in. It's not cheap at £26 a pot but as a treat, I would definitely re-purchase, it would also make a really lovely gift for someone. 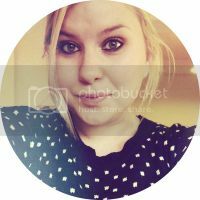 This was my first delve into buying Laura Mercier products, but within a week I wanted more as you may have seen in this post! It's made me want more....and more, so I think there will definitely be some more Laura Mercier purchases lined up! I picked mine up here for £26. Any hints on what should be my next purchase from Laura Mercier?